No matter who you are or what you do the worst thing is getting distracted by uncomfortable clothing whilst you're training. You wouldn't get that feeling in this top. Grab the Canterbury Vaposhield Tech Drill Training Top in Black now. 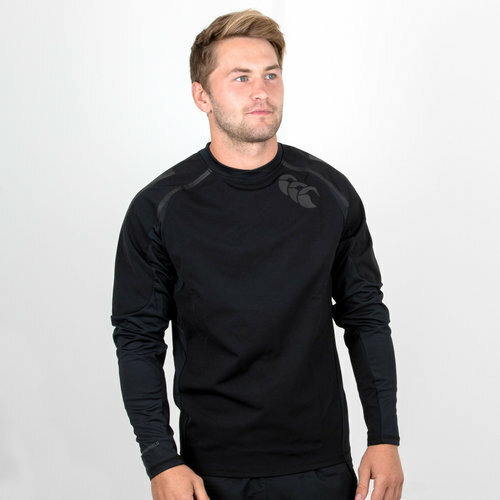 This training top moves with the wearer thanks to the articulated seams as they train allowing you to put your all into everything that you do whilst keeping you warm without overheating. This jacket has been tried and tested meaning the results of this design are even better than previous models. It has waterproof protection in critical areas which still allows for breathability. The Vaposhied technology repels water off the fabric surface keeping the wearer dry on the outside and the inside. The hydrophobic upper section keeps the rain out whilst the breathable lower section transfers moisture away from core muscles. The stepped hem reduces garment lifting meaning distractions are minimised whilst the stretch underarm allows for lifting without the body of the top rising. Low profile 1 piece crossover crew neck design is driven by athlete insight to minimise distraction. Unique 3D print on the shoulders diverts water build-up while bonded tape acts as the last line of defence against the rain. Positions rain protection and breathability exactly where you need it most. Model's height: 179 cm/ 5'9"